The last few years of my gluten eating days, I had an obsession with all things whole wheat – cookies, muffins, pancakes, scones, breads. I had discovered Bob’s Red Mill Whole Wheat Pastry Flour, and let me tell you – I was in love. Do you remember the almost nutty flavor and spectacular combination of heartiness and lightness of whole wheat pastry flour? I sure do, and so does my family. I had developed or found a lot of recipes using whole wheat pastry flour that quickly became family favorites. Slowly, slowly, I’m converting them to gluten-free. My latest project is a maple oatmeal nut cookie that I’m pretty sure was an adaptation of a cookie from the cookbook “Uprisings.” I’m not 100% sure on that. But, I think that’s where the original recipe came from. I’m fairly sure our family favorite was an adaptation, which makes this an adaptation of an adaptation. Does that count as an original then? I don’t usually specify brands in my recipes. But, have you heard about the Bob’s Red Mill recipe photo contest? They’re such a great company and are doing so much for the gluten-free community that I just have to participate. And, I recently reviewed the Tropical Traditions coconut oil. I’m loving this stuff in baked goods. If you haven’t tried it, I encourage you to do so. It is so delicious. Preheat oven to 350°. In a large mixing bowl, mix the flax seed meal and water. Add the coconut oil, maple syrup and vanilla. Beat with electric mixer until light. In a small bowl, mix the sorghum flour, arrowroot starch, xanthan gum, salt, and baking soda. Add to wet mixture and mix until well blended. Blend in the oats. Stir in the pecans. Dough can be chilled at this point or used immediately. Using a small cookie scoop, drop scoops of dough onto parchment lined cookie sheets. Gently flatten cookies with the palm on your hand. (These cookies don’t spread much.) Bake for 10-12 minutes until golden brown. This post is linked to Amy’s Slightly Indulgent Tuesdays at Simply Sugar and Gluten Free. And the Gluten Free Homemaker’s Gluten Free Wednesdays. And Healthy Food Lover’s Wholesome Whole Food. 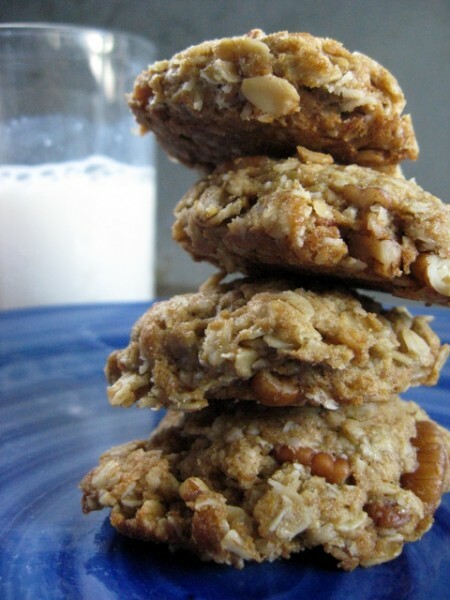 This entry was posted in Blogger Community, Contests, cookies, flax seed, nuts, oatmeal. Bookmark the permalink. Thanks Shirley. Let me know how they turn out with another flour! Those look delicious! I love the ingredients. Sorghum is one of my favorites. Thanks for participating in Gluten-Free Wednesdays. Hi, these look great! I’m excited to try them. Just a few questions though… is the flaxseed meal and water what you are using in place of an egg or two? If I did want to use eggs, how many would I use? Can cornstarch or something else be used in place of arrowroot starch? And, the Tropical Traditions coconut oil looks great, but it is on the expensive side. Have you found any other virgin coconut oils that are easier to buy (i.e. not online) and more affordable? Hope this wasn’t too many questions for you. Thanks!! Never too many questions. Yes – the flax seed meal and water is in place of egg. I think about 1 large egg would do it. Yes you could use cornstarch in place of arrowroot starch. You can use any coconut oil. The Tropical Traditions virgin stuff is not deodorized and has a distinctly coconut aroma, where as others I’ve tried have not. But, it’s not required for the cookies to still be good. I hope they work out for you with your substitutions. I’m all about making recipes your own. Enjoy! Thanks for your quick reply! I’m excited to make these soon. These look great. I’ve been on a cookie jag lately. 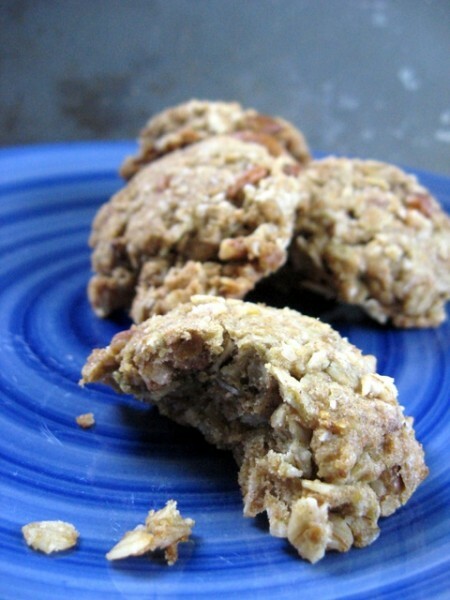 The pecans make the cookies look especially appealing. Bet you could add chocolate chips, too!!!! OMG those look so good it’s ridiculous! Looks like a great recipe. I looked for it again on http://www.glutenfreefeed.com/ because I selfishly want to think I’ll be able to find all the GF recipes there; especially the ones that are more vegan friendly! So many GF recipes are absolutely saturated with dairy and eggs it just boggles the mind. Well, it doesn’t take much to boggle my mind admittedly. I’ll be checking back for more great ideas though as today was my first visit. I know you already saw, but I wanted to let you know anyway that I added these cookies to my favorite recipes from last week. Cause they look perfect! 🙂 Thanks! Thank you, Aubree Cherie! Much appreciated! Waw, Deanne!! These look irristable! Hello, and thank you for the lovely, yummy-looking recipe! I noted in Step 2 that salt is mentioned prior to baking soday. How much salt should I add? Thanks so much!